Once you've made your own microscope, you might consider sharing what you've learned by organizing a workshop. I started running in-school workshops for elementary school teachers after contacting one of my own kids' teachers to ask if this seemed of interest to elementary school teachers. The feedback was great—the microscopes were an easy and inexpensive replacement for dusty old microscopes that only one person could look into at a time. Below are some tips for anyone who'd like to run their own workshops, based on our experiences so far. Kenji's original Instructable is of course a great resource — I recommend reading that first. What's below assumes that you've already seen the Instructable, which includes a full parts list. Participants look at microscopic things, become pros at using their microscopes, and collect images, which we all share with each other. For workshops with teachers, the teachers share their ideas about ways to best use the microscopes with kids in classrooms. We provide enough materials for each workshop participant to take away their own microscope. The parts typically cost us under $10 per microscope, with prices depending in part on bulk discounts. Many of the detailed ideas below were shaped by input from teachers, college students, museum staff, volunteers, and other workshop participants—thanks! I buy lenses in bulk from aixiz.com (as recommended on Kenji's instructable) instead of taking them from laser pointers as some people do. Based on teacher recommendations, I've been making 8x10 inch microscopes (a little bigger than in the Instructable) to fit large smartphones or iPads/tablets. In most elementary school classrooms, only the teacher will have a smartphone, of course, but some schools have multiple iPads or other tablets that classrooms can use. iPads have the camera on a corner, which means that an iPad can fit on the microscope diagonally with the camera on top of the lens if (1) the three holes are drilled in the plexiglass and wood close to the edges—generally within 1 inch of the edges and (2) the lens hole is roughly in line with the two other nearby holes. For tablets with the lens in other locations, you may need to get creative with where you put your lens. I use Optix 0.08 inch thick clear acrylic sheet plexiglass, which comes in 8x10 inch sheets and is easy to break by scoring with a razor blade along a straight line and then bending really hard by hand (while wearing goggles). For 8x10 inch microscopes, I cut 8x10 inch Optix sheets in thirds to make 8 inch x 3 1/3 inch stages. In my experience, a drill press does a great job of drilling through the plexiglass without breaking it, much better than a hand drill does (see video on this page). Some makerspaces have drill presses available for you to use. If you're not using springs (see more about springs below), then be sure to drill the stage (the 8 x 3 1/3 inch plexiglass piece) in places that will allow the stage to balance on the wing nuts--centered on the roughly 3 1/3 inch breadth. We sometimes mark the upper right edges of the wood and plexiglass and drill these three pieces at once, taped together with painters tape, so that each set will fit together perfectly even if the drill holes are only approximately in the places where you want them to be. If you do this, be sure not to mix up which stage goes with which wood bottom and plexiglass top. Or you can drill 3 holes in 1 piece of plexiglass and use that piece as a template for every piece of wood or plexiglass (that's what I did for the drilling in the example video - you'll see blue circles where I marked spots to drill). A 11/32 inch (8.7mm) drill bit is absolutely ideal for drilling the lens hole. With this size drill bit, the lens will fit snugly in the hole. Put a tiny drop or two of superglue on the lens housing before pressing it into the lens hole (I press it in with a wood block if it's a tight fit). I put some wax paper underneath so that I can push the lens down through the hole until it's perfectly flush with the plexiglass surface, without gluing everything to my work surface by mistake. If the lens is a little loose in the hole, add a little extra superglue and rotate the lens in the hole to spread the glue a little, and allow to dry for 2 hours. Take care not to touch the glass of the lens (the lens works best when it remains clean) or to glue your fingers. On rare occasions, a lens will come loose, so you may want to tell workshop participants that they can use superglue to fix that. Superglue fumes have a strange effect on plexiglass, causing plexiglass nearby (within a few millimeters) to turn frosted. So don't use excessive amounts of superglue, and as the superglue dries, don't leave the drying lens/plexiglass in contact with other plexiglass pieces. Before the workshop, we ask each participant to bring in at least 5 things to look at, including at least two things that are likely to be unique—things that no one else will probably bring. Some ideas: salt, cloth, small flowers, cloth band-aids, velcro, torn paper, feathers, sandpaper, money, lint, onion, and bugs, bugs, and more bugs! It's been great fun to see what people bring. I bring along a bag of goodies for anyone who runs out of things to look at, including some iodine (available at drug stores) and an onion for anyone who wants to see onion cells (details below). I bring along a roll of clear packing tape to use pieces as makeshift clear microscope slides. The tape works well to immobilize live bugs too. And I bring a ruler that has millimeters on it, in case anyone asks about magnification (details below). I try to bring only things that people can find easily (nothing from my research lab) so that people can see what's possible without any hard-to-find equipment. For each workshop, I set up a Flickr.com site in advance for people to upload their photos to a gallery. You can set up a gallery for each workshop you do, but I think to do that, you need a unique email address for each Flickr gallery you make... so I just keep getting a new Gmail address for each Flickr gallery I set up. I have workshop participants upload their images directly into the Flickr gallery via email. Here's how to get the email address to share with participants. This makes it easy for participants to send photos right from the smartphones/tablets they're using, and the Flickr gallery is a beautiful thing that they can share with others if they like. I sometimes crop some of their photos on Flickr afterwards. 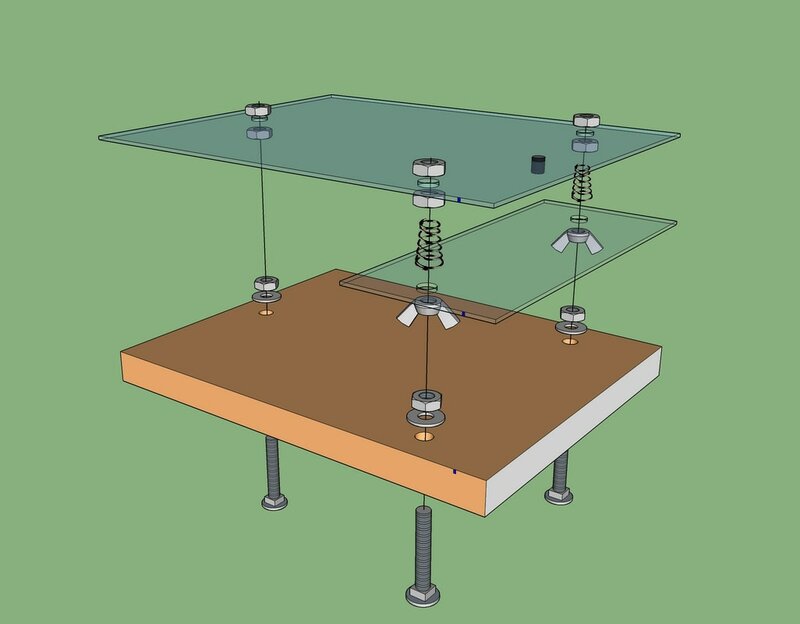 I give everyone the wood, plexiglass stage, and plexiglass/lens top part, and then have them get the other parts from a table, showing them the "loose parts" diagram shown here so they know how many of each part they'll need. 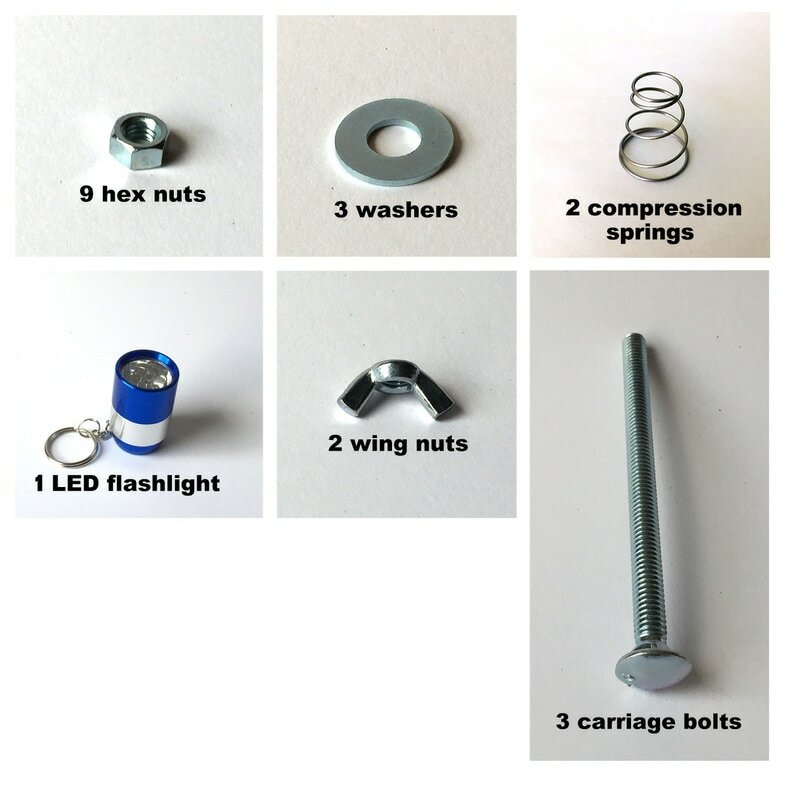 I leave all of the loose parts that come from hardware stores in their original hardware boxes, so that they participants can see for themselves that most of these parts can be found in hardware stores if they want to make more microscopes, and they learn the name of each part if they don't know the names already. I show the assembly diagram that I made to workshop participants by either projecting it on a screen or printing it out. Feel free of course to use the same diagram yourself. Then, I usually show people how the microscope is supposed to work. It's not much more than a lens on the end of your smartphone/tablet, except that the stage and wingnuts allow for fine control of focus position, and the loose LED light allows for creative lighting solutions (unlike on many laboratory microscopes, you can easily move the light to wherever you like). These two features make a world of difference for being able to readily see microscopic detail. I walk around, help out, and answer questions. Sometimes other people who've built these in previous workshops volunteer to come along and pitch in. A tip for how to put the camera down onto the lens accurately: Lay the smartphone down flat in just roughly the right place, then tip up one end of the smartphone—the end where the camera lens is—and then slowly tip it back down while aiming for the lens. Remove the smartphone/tablet case if it's thick, and the camera will be able to sit closer to the lens. If you see a black ring around all of your images, that's the lens casing. Removing your smartphone/tablet case and then zooming a little will take care of that. I ask teachers about any specific curriculum-related goals—for example to see cells—and I try to help them meet those goals. In my state, North Carolina, the public school science curriculum has a focus on insects (2nd grade), bones and muscles (3rd), minerals and other matter (4th) and cells (5th). I give tips for lighting. For clear things (pond water for example), try putting something dark in the background (like black paper on the wood below the lens) and lighting the objects from the side. Microscopists call this "darkfield illumination", which even on expensive microscopes sometimes isn't included or can be tricky to figure out how to do. Darkfield illumination is what we all use naturally to see clear things, even without microscopes. For example, snowflakes are easy to see where they're lit from nearby but with a dark background. Next time it snows at night, notice how you're naturally taking advantage of darkfield illumination to see if it's snowing. It works the same for rain, although most people just look for wet surfaces or raindrops in puddles to see if it's raining! The springs help stabilize the stage, which is pretty wobbly otherwise. If you can't find springs, use a really low-tech solution in place of them: gently push a piece of wadded-up paper towel between the stage and the top plexiglass to stop the stage from wobbling. I give people the email address that I got from Flickr (see above) for them to upload their images as they take them, and I project the resulting images on a screen throughout the workshop. You'll hear a few "what the heck is that" questions from participants, which leads to great interactions among the participants. Often I find that photos keep appearing at the Flickr gallery for days after the workshop, as participants keep collecting images and sharing them. Ask participants to email 1 picture or video at a time to the Flickr email address, using the subject line to say what the picture is of, and removing any signature line from their emails (or else the signature line will appear publicly on Flickr). Want to try seeing individual cells? Flower petals with super-contrasting colors (like dark stripes on white petals) often have one color per cell, making the borders between colors great places to see individual cells. Red onions are fantastic too — peel back past the dry layers and look at a fresh red later, and you'll see beautiful red cells with white outlines. Or try the old white onion and iodine trick: Remove the dry layers of an onion, and then from the parts of the onion that you'd normally eat, rip pieces off until you get some paper-thin slivers of onion, add a drop of iodine to those slivers, and blot away excess iodine. The iodine reacts with starch in the cell walls, making the cell walls dark and hence easy to see. Each cell will also have a dark clump of starch grains. Curious about what magnification you're getting? 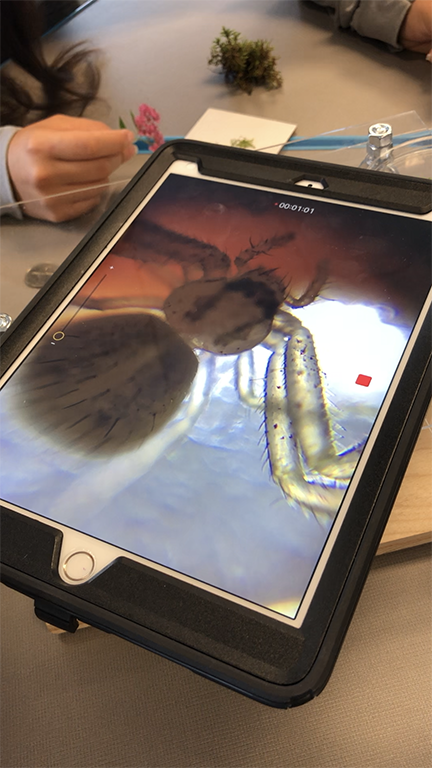 You're magnifying at multiple steps: at the microscope lens, your smartphone/tablet camera lens, any digital magnification, and then a projector in some cases too. To calculate the final magnification, simply take a picture of your ruler (I usually zoom in on one millimeter), and then measure how many millimeters long the image is on your smartphone/tablet. The magnification is simply how many times larger that your original millimeter appears (in other words, one millimeter that measures out to 40mm long on your tablet is magnified 40 times). On a projected screen, this number will typically be a few hundred times magnification. On a phone, it will be up to about 30-40 times magnification. I always give credit to Kenji Yoshino for the original microscope design, and I tell people how to find his Instructable. Feel free of course to share this web site with anyone if you think it would be helpful to them, or if they want to run their own workshop. Please do share any photo galleries that you make with us. I'd love to see them, and I'd be happy to share them on our photo galleries page. I'd also love to exchange ideas, and hear what you learned about how we might improve the workshops or this set of instructions.